Understanding how your users are using Office 365 is extremely important to you as an Office 365 admin. It allows you to efficiently monitor your service, identify issues, plan support and training and to report back on the investment to your management. Today, we’re excited to announce the new reporting portal, which provides you with valuable insights about how the Office 365 services are being used and delivers details down to the individual user level directly in the new Office 365 admin center—and it’s rolling out now! When we started the process of revamping reports in Office 365 about a year ago, it was extremely important for us to include customer feedback into the development process from the very beginning. The first version of the new reporting portal includes a new activity dashboard and a variety of new reports that provide consistent insights across all Office 365 services with a highly improved user experience. The centerpiece of the new reporting is a cross-service portal that gives you more visibility into your organization’s use of Office 365, making it easy for you to make decisions or report back to your management. Graphs help you visualize key data allowing you to quickly comprehend the information. You will be able to see how many users have used each workload as well as a key summary of the activity within each product. You can also pivot the reports to different reporting periods (7, 30, 60 and 90 days) to identify trends. 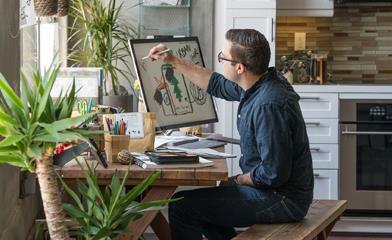 When using Office 365, organizations want to have a clear understanding of the return on their investment. 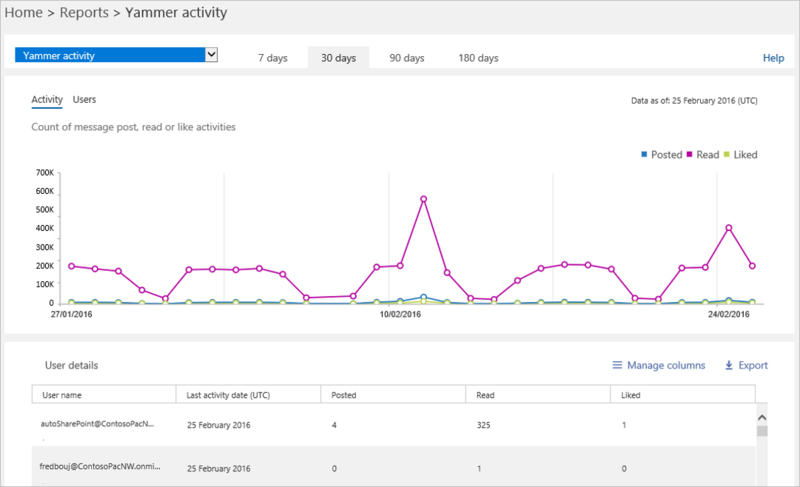 Especially during the rollout process, Office 365 admins often have to provide reports on a weekly or even daily basis showing how users are adopting it. The new reporting portal gives you a quick way to establish that you are getting value out of your Office 365 subscription by surfacing usage information for your Office 365 tenant as well as for each specific workload. The new reports give you the ability to drill down on single services and access detailed information at the individual user level. To enhance productivity and usage of Office 365 among your users and to effectively plan training and communications around this, you need to understand exactly what’s happening within each service and how individual end users in your organization are consuming or—often more important—not consuming the service. Simply click the specific tile on the portal to get to the more detailed information. From there, you can also export the entire report into CSV format and open it with a tool like Excel to quickly filter or pivot the data for further analysis. The rollout for Europe, APAC and Latin America will start in April. You’ll find the reporting link directly on the home of the new admin center as well as in the left menu. This is just the beginning. In April, we’ll make more reports available to U.S., Australian and Canadian organizations, providing insights on SharePoint and OneDrive site usage as well as on Yammer and Skype for Business activity—with organizations in Europe, APAC and Latin America following in May. 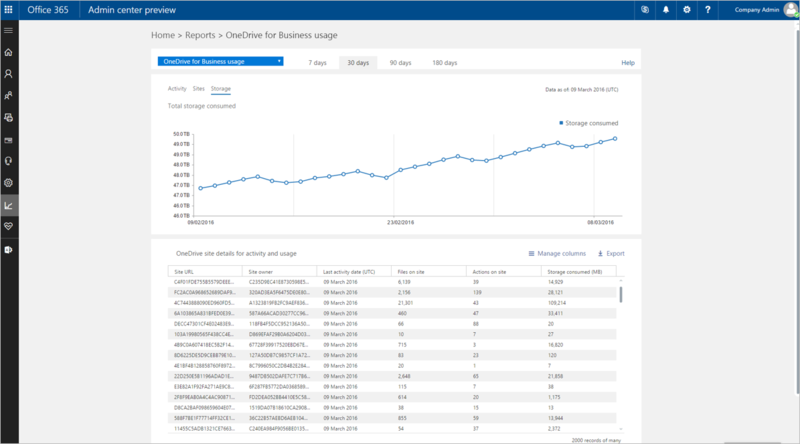 More reports focusing on SharePoint and OneDrive for Business user activity and on user interaction with Office 365 (i.e. which browsers or operating systems do they use when they access the service) will be incrementally added. We’ll also provide you with a Power BI Content Pack, which will combine your organization’s Office 365 usage data with your user’s information to provide richer insights into how your users are using Office 365. 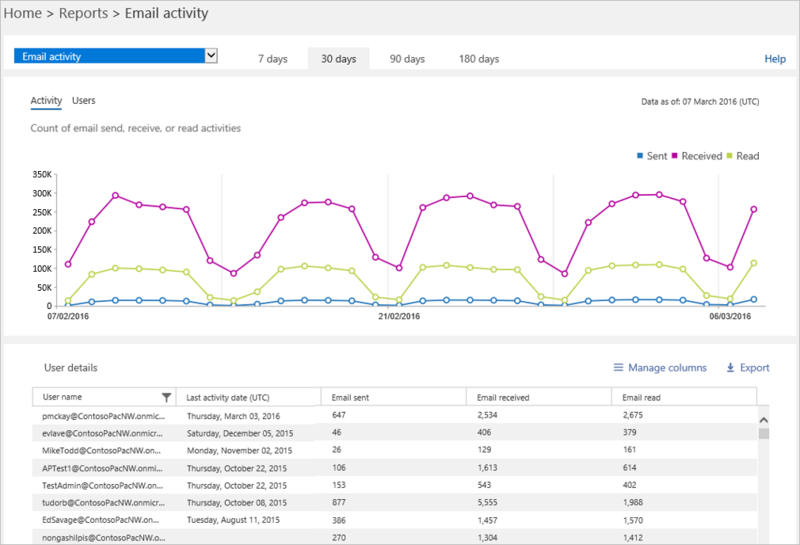 The content pack will allow advanced analytics scenarios, such as pivoting email usage by attributes like departments or regions and will make it easy for you to share insights within your organization. The Power BI Content Pack will be rolled out in June. New privacy features will allow you to replace user level details with anonymized user information to protect users’ privacy and to enable you to comply with organizational requirements. In the spring of 2017, we will provide new public APIs that will enable you to programmatically access the usage data and integrate it into custom applications like a company reporting portal. Please use the feedback widget on the site to let us know what you think. Your feedback is extremely important to us as we continue to improve the reporting experience in Office 365, and we read every single message we get.